Home water pipe repair is definitely no fun this time of year in Tulsa. 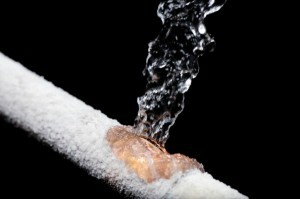 Your home water pipes can become frozen in the winter and burst. During the hot and dry seasons you don’t have frozen pipes but water pipes can break when the ground shifts. Frozen and burst pipes will cause major damage to your home’s interior, your furnishings and do major structural damage as well. Go through out water pipe repair tips and learn how to repair and prevent frozen water pipes this winter. An ounce of prevention is worth it’s weight in gold for water pipe repair. For Tulsa we suggest that you use several tried and true methods to prevent frozen water pipes. The easiest method is to use heat tape for your pipes. Use the heat tape on water pipes that are exposed to the cold temperatures in areas such as the garage, closets that may be on the outside walls, and under the your house. You can also wrap your water pipes with insulation to help prevent water pipe repair. During extremely cold weather another easy prevention is to let the kitchen faucet drip. Doing This will keep the water moving in the pipes and makes it more difficult for the pipes to freeze. To prevent a water pipe repair you can also open the lower cabinet doors in the bathroom and kitchen letting the warm air in your home circulate around your water pipes. There are several methods you can use to repair you home water pipes. Whatever method you choose to use the #1 Key is to make sure the pipes are dry. First the easiest method is to get a repair clamp at a hardware store. The repair clamp will get you going again but it is really a band-aid approach. When finished you have not repaired your leak, just temporarily stop the leak. A clamp will work for PVC, copper and steel pipes. Another do it yourself repair can be done on copper pipes. Using a repair sleeve you can cut the bad spot out with tubing cutters and slide the sleeve in place. Next all you need to do is solder the copper pipes and you have repaired your water pipe. DIY repairs of PVC water pipes is common. A trip to the hardware store for some pipe, couplings, and PVC materials is all you will need. You can either buy a tubing cutter or use a saw to cut you old pipe out and cut the size of the replacement. Follow the instructions with the glue material and replace the bad section of pipe. This results in a repaired water pipe. If you have steel pipes as many older homes do, your best bet is to call a plumber. To do this job you need a pipe cutter and pipe threader which most home owners do not have. This type of repair really is best done by a professional plumber. Repairing frozen water pipes can be quite a chore. 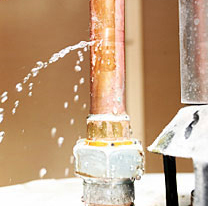 Circle B Mechanical has been repairing home and commercial water pipes for years. We have the tools, equipment and know how to get your water pipe repair done quickly to get you home and business back in order. Whether it is frozen water pipes or a burst water pipe, call Circle B Mechanical at (918) 367-6298 for water pipe repair in Tulsa. This entry was posted in water leaks and tagged burst pipes, freezing weather, frozen water pipes, Tulsa, water pipe repair. Bookmark the permalink.